Hungary i/ˈhʌŋɡəri/ (Hungarian: Magyarország [ˈmɒɟɒrorsaːɡ] ( listen)) is a landlocked country in Central Europe. It is situated in the Carpathian Basin and is bordered by Slovakia to the north, Ukraine and Romania to the east, Serbia and Croatia to the south, Slovenia to the southwest and Austria to the west. The capital and largest city is Budapest. 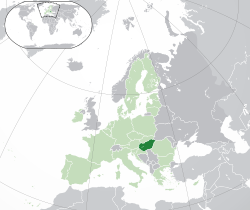 Hungary is a member of the European Union, NATO, the OECD, the Visegrád Group, and is a Schengen state. The official language is Hungarian, also known as Magyar, which is part of the Finno-Ugric group and is the most widely spoken non-Indo-European language in Europe. Following a Celtic (after c. 450 BC) and a Roman (AD 9 - c. 430) period, the foundation of Hungary was laid in the late 9th century by the Hungarian ruler Árpád, whose great-grandson Saint Stephen I was crowned with a crown sent by the pope from Rome in 1000 AD. The Kingdom of Hungary lasted for 946 years,[note 1] and at various points was regarded as one of the cultural centres of the Western world. After about 150 years of partial Ottoman occupation (1541–1699), Hungary was integrated into the Habsburg Monarchy, and later constituted half of the Austro-Hungarian dual monarchy (1867–1918).